Summary: Lillian and her restaurant have a way of drawing people together. There’s Al, the accountant who finds meaning in numbers and ritual; Chloe, a budding chef who hasn’t learned to trust after heartbreak; Finnegan, quiet and steady as a tree, who can disappear into the background despite his massive height; Louise, Al’s wife, whose anger simmers just below the boiling point; and Isabelle, whose memories are slowly slipping from her grasp. And there’s Lillian herself, whose life has taken a turn she didn’t expect. . . .
Do you ever just crave good old comfort food like macaroni and cheese or chicken and dumplings? I know I do! But I also crave books that make me feel the same way. Ones that just make me feel good about the strength and resilience of individuals. And that's when I read for an Erica Bauermeister novel. Her books just make me happy and content with life! 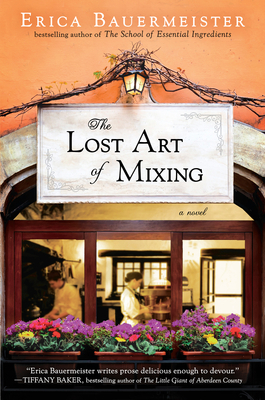 THE LOST ART OF MIXING is a sequel to Ms. Bauermeister's best-selling novel THE SCHOOL OF ESSENTIAL INGREDIENTS (which I loved -- my review); and if you enjoyed that one, then you will definitely want to read this one. THE LOST ART OF MIXING has the same look and feel as THE SCHOOL OF ESSENTIAL INGREDIENTS, and once again, Ms. Bauermeister has managed to create memorable characters who learn some very valuable life lessons. In THE LOST ART OF MIXING, Lillian is back with a new bunch of students and a big surprise of her own. She is still in a relationship with Tom, the widower from the last book, yet she's not entirely sure she's ready to share her exciting news. In addition to these characters, there is Al, an accountant who longs for structure and ritual and his angry wife Louise. There is also Chloe, a chef in training who is afraid to try again after a devastating heartbreak, and Isabelle, an elderly woman who discovers that she is losing her memory. Finally, there is Finnegan, who seems to blend into the background despite his huge physical presence. Naturally, all of these characters' lives are interwoven in this novel through their connection to food as well as their relationships with each other. As I read my review for THE SCHOOL OF ESSENTIAL INGREDIENTS, I quickly realized that I presently have many of the same thoughts and feelings as I did after I read the first book. Once again, I loved how Ms. Bauermeister told this story, using a different chapter to tell each character's story. In addition, I enjoyed all of her references and gorgeous descriptions of food, although I'm not quite sure these were as vivid as they were in the last book. And finally, I loved the various lessons that each character learned about him or herself. In THE LOST ART OF MIXING, many different types of relationships were explored, and most of these relationships were having problems in some form or another. Through these difficult times, the characters in this novel were able to learn some important life lessons like how to trust and how to forgive, how to grieve and then move on, and even the importance of memories and rituals. I have a feeling that these characters and their struggles will resonate with many readers. One thing that did stand out to me about THE LOST ART OF MIXING was the symbolism of the title-- or at least how I interpreted it. At its heart, this novel was about how people come together (and apart) throughout the course of their lives -- thus the term "mixing." There are times when we will be have disagreements or complications with those we love, and other times when everything seems to be great. It's almost as if our lives are constantly in motion, blending together all of our encounters, relationships, etc. to make us who we are! There is no doubt that THE LOST ART OF MIXING would make a fantastic book club selection. I found this reading guide on Ms. Bauermeister's blog, and I think it's fantastic. There are twelve questions concerning such topics as honesty, family, love, grief, stereotypes, and conflict. Because each character is so unique, yet experiencing some pretty universal feelings, I think there will be a great deal to discuss. Overall, I enjoyed THE LOST ART OF MIXING as much as THE SCHOOL OF ESSENTIAL INGREDIENTS. Recommend to fans of women's fiction as well as foodies! I have this but keep hearing one should really pre-read or re-read (or remember!) the first book, which I haven't found yet in my packed boxes, so I haven't gotten to it yet! I can't wait to get my hands on this! I loved School of Essential Ingredients. I loved Lillian and The School of Essential Ingredients and need to pull this one out of my stacks to read soon. Great review! I read both books last year back to back and have a giveaway for lost art going. I really loved both of them and appreciated how the second book seemed to focus more on the relationships of the people and less on the food. I read her Joy for Beginners and just loved it. Haven't gotten to The School of Essential Ingredients but think I need to so I can then read this one! I loved this one too. I read it right after reading The School of Essential Ingredients. I really liked this one too! Over the holidays I read Joy for Beginners. Only problem I have now is having to wait for each new novel to come from this author! This sounds like a charming book. Thank you for such an informative review. Also, I see that you are reading The Painted Girls. It has all of my favorite elements including dance and suspense. I am looking forward to your review. New follower, looking forward to your posts. I'm glad you enjoyed this one, too. Bauermeister is on my list of comfort-read authors, along with Karen White and Jill Mansell. This does look like a good one. I am definitely going to check it out. @Marg... I definitely understand the frustration of having to wait for an author to come out with the next book. S. L. Whyte is coming out with a new series in March titled, "Stelladaur: Finding Tir Na Nog," it looks like a great book for all ages. I know I am going to love it so it will be torture waiting for the subsequent books to come out.